Types of Ration card in India – The National Food security of India has introduced a different types of Ration cards in India depend on Financial Income of family to get the essential commodities at low price. Each and every household can apply for the Food Security in their state. It can be useful to get the essential commodities and also can be used as a Legal Proof Documents in accessing any government services. To get the Ration Card you can either apply for it through nearest Ration Shop or you can apply for it online. You can also apply through your Mobile by using the TNEPDS App or PDS Public Mobile App ( The APP Is only for Tamil Nadu people only ). The following points are the list of the benefits of having a NFS. It can act as a Proof of Identity Document. It can be used while opening or creating a new bank account. You can also use it as a Proof of Residence. Offers or any discounts provided by NFS to all Indian Citizens. All the types and their benefits are organised in this article. But Tamil Nadu has recently started issuing Smart Ration Cards instead of Old Ration Cards for the new users. Keep that in mind while you are going through this article. Applicants for the NFSC Cards are given a card based on their choice and commodities they needed to have after they get it. Each Type of Ration cards have the difference in benefits and commodities received for it. All Commodity Cards: These are also known as Antyodaya Anna Yojana (AAY) Ration cards. These are generally Green or Yellow in colour and are issued to those applicants who are opting for the Rice and also for other Essential Commodities. Sugar Cards: These are usually Saffron in colour given to those who are mainly opting for the Sugar instead of Rice. People having these Sugar Cards can be able to buy all the essential Commodities except for Rice. These are also known as Below Poverty Line (BPL). No Commodity Cards: These are identical to the Sugar Cards but white in colour. These cards are issued to those people who are not interested in buying any commodity under the Public Distribution System (PDS). These are also known as Above Poverty Line (APL) cards. Another fact is that people holding Below Poverty Line (BPL) Ration cards can also get an additional 3 KG of rice in lieu of Rice. It is limited to those People who are having only BPL Cards. The following image includes an Image which shows the Scale of Commodity provided to each type of Cardholder. 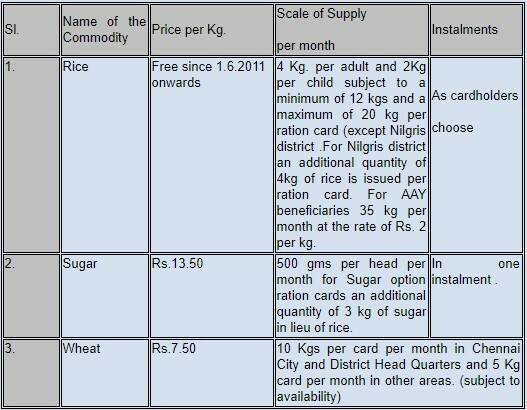 As per mentioned in the above image, each commodity is issued to each type of Ration Card Holder. These Ratios generally vary from city to town and town to Village. Similarly, the Scale of Kerosene supply for Ration Cardholders also depends on the Number of LPG Cylinders. Usually, of all the other commodities, Kerosene Price ranges from Rs. 13.60 to 14.20 per litre taking into the distance of taluk to the Oil Terminal. But in some Taluks, the price of the Kerosene is fixed. All the Citizens in India will be categorised into these AAY, APL, and BPL ration cards according to their annual income and social status of the whole family. 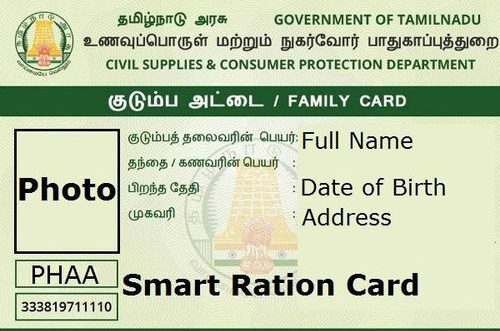 As the Tamil Nadu State Government is currently issuing the Smart Cards instead of those Old Ration Cards, you should have to know about the types in this Smart cards. At first, these cards are divided into three categories like Above Poverty Line (APL), Below Poverty Line (BPL), Antyodaya Anna Yojana (AAY) etc. Of all types, only APL and BPL Smart cards are classified into two categories as PHH and NPHH referring to Priority Household and Non-Priority Household respectively. Later they were classified as PHHRICE, PHHA, NPHH or NPHHL, NPHHS, and NPHHNC. PHHRICE: It is a Priority Household Card which is issued to those people who opts for Rice as an Essential Commodity. Benefits are all commodities like Sugar, Rice, Kerosene, Wheat etc. PHHA: People who are holding these PHHA will get 35KG of Rice and all commodities like Sugar, Kerosene, Wheat, Oil etc. NPHH or NPHHL: This refers to People of Tamil Nadu having these will get the Rice and all other commodities like Sugar, Kerosene, Wheat, Oil, Toor Dhall etc. NPHHS: This refers to the Non – Priority Household Sugar card which will avail the benefits of having only Sugar as the Commodity. NPHHNC: This refers to the Non – Priority Household No Commodities. The name also reveals that the benefits that are availed by this card are of none. No Commodities are given to the People who are holding these NPHHNC cards. For more information related to Different types of Ration card in India and other National Food security information do comment here.